It occurred to me recently that I don’t have a list of my favourite carbs in Sydney, which is almost ridiculous considering the name of my blog. I’ve kept my definition of carbs pretty loose in this case – it just needs to be the absolute hero of the dish. I’m also keeping it savory because I’m way more into salty food than I am into sugar. For your reference, here is how I rank my carbs (this is a question I ask people a lot). As you can see, my childhood in Berlin has influenced my preferences a lot. So, this list of my fave carbs in Sydney includes the above but also pizza (which probably counts as bread anyway), plus corn, which I should probably add to my ranking. I think it would potentially be at the bottom anyway because it’s just not as versatile as the others. I don’t even want to know how much butter there is in the mash at Mary’s… Well, I’m lying. I do want to know. I’m not one to shy away from butter (just ask any of my friends what my butter to bread ratio is). Even though I’m also into the burgers at Mary’s in Newown, it’s actually that holy grail of mash & gravy that keeps me coming back. 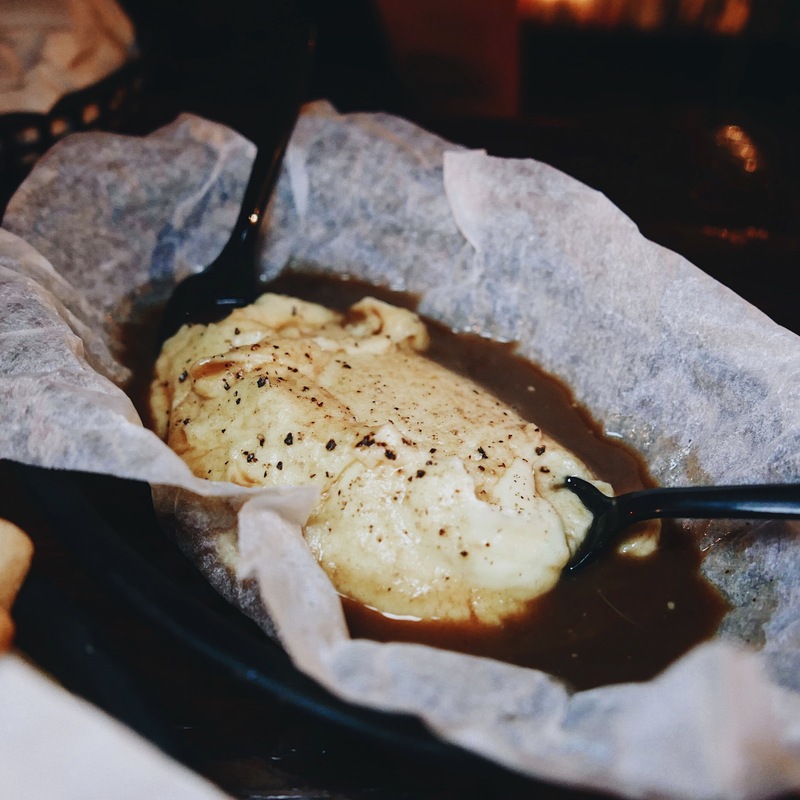 The insanely buttery mash sits on paper in a plastic basket (odd choice of vessel for mash, but what the hey), perched in a pool of flavorsome gravy with two black plastic spoons poking out. Hello heaven. The uneven ribbons of knife-sliced noodles at Chinese Noodle House with that sloppy pork mince sauce and shredded cucumber is almost like a distant cousin to spaghetti bolognese. I amp it up with a good heap of soy sauce and chilli oil to max out on flavor. The fresh, slightly crunchy cucumber oddly works a charm against the rich pork mince, making it my ultimate quick feed in Sydney. More on Chinese Noodle House here. When I was a kid, my answer to ‘What’s your favorite food’ was always lasagne. Not much has changed, though I’d probably put lasagne on par with potato gratin nowadays. The best lasagne I’ve come across in Sydney so far is without a doubt at Potts Point institution Fratelli Paradiso. Served in its own little dish, it’s the perfect balance of rich, cheesy, and creamy. PS. The other pasta is also excellent – more ramblings on Fratelli Paradiso are here. Bread holds a special place in my heart. Firstly, I’m German (although I don’t love beer and meat – go figure). Secondly, I worked at Brasserie Bread for over five years, where I ate excellent bread every day. The quinoa & soya sourdough was the first loaf I ever tried from Brasserie Bread and it remained my fave over the years. 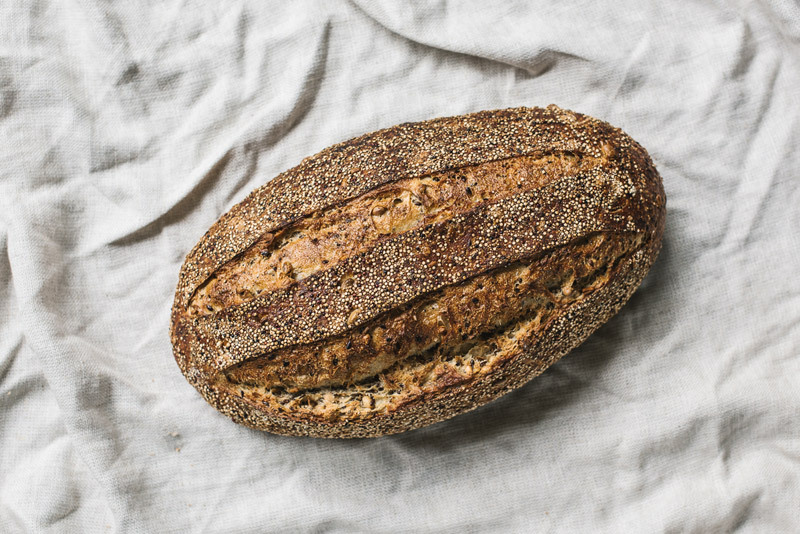 Plump whole soy beans, a dense crumb dotted with quinoa, linseed, amaranth, and nigella, plus a crunchy crust are the distinct characteristics of this beautiful loaf of bread. At Kingsford ramen joint Manpuku the number 7 ramen is such a long name that on the receipt it simply says “Long Name”. Are you ready? It’s called kono deaini kanshashite aijou to jonetsu komete isshoukenmei tsukutta uchirano icchan sukina manpuku shiawase ramen. So to be honest it’s unsurprising that it’s called Long Name. I prefer to call in number 7. The soy-based pork and chicken soup is so perfectly balanced with umami flavor but without that crazy thick richness of a full tonkotsu broth. 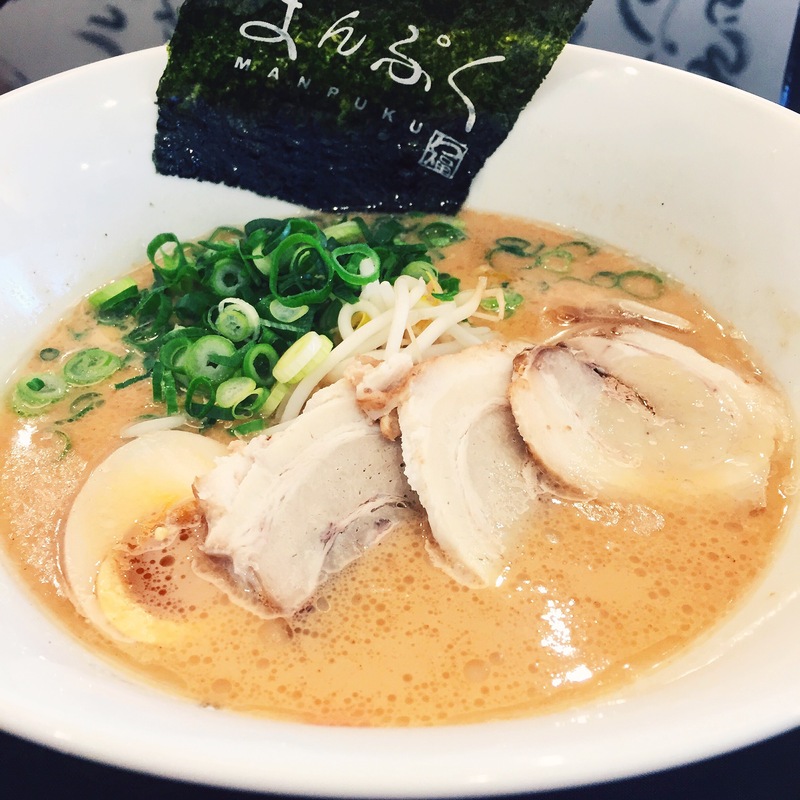 It’s by far my favorite ramen in Sydney. The spicy and salty kick of a diavola pizza is what appeals to me. 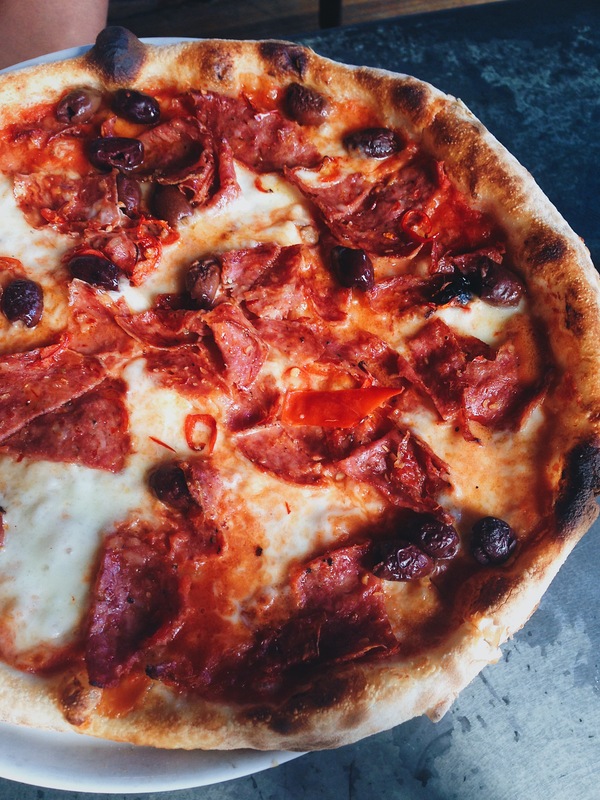 Translating to “devil”, presumably because of its fiery flavors, the diavola at Vacanza is made with San Marzano tomatoes, fior di latte, hot sopressa, fresh chilli, and Kalamata olives. That extra hit of fresh chilli is so delicious and the saltiness of Kalamata olives adds a bonus savoriness. I can’t stress enough how amazing the Pommes Anna is at Hubert. A contemporary take on Pommes Anna, the layered potato dish is cut into jagged-looking pieces and deep fried. But the piece de resistance is the moreish beurre blanc that the jagged potato pieces are resting in. More praise about Hubert can be found in this blog post. There’s something so comforting about a plate of Indonesian fried rice, especially if it has a perfectly fried egg on top. At Lestari, it’s made with pork and has an awesome smoky flavor. It’s on the sweet side, but nasi goreng is more on the sweet spectrum compared to other fried rice dishes in Asia. You can specify how spicy you want the Lestari fried rice. It’s without question that I order mine spicy and it absolutely delivers. 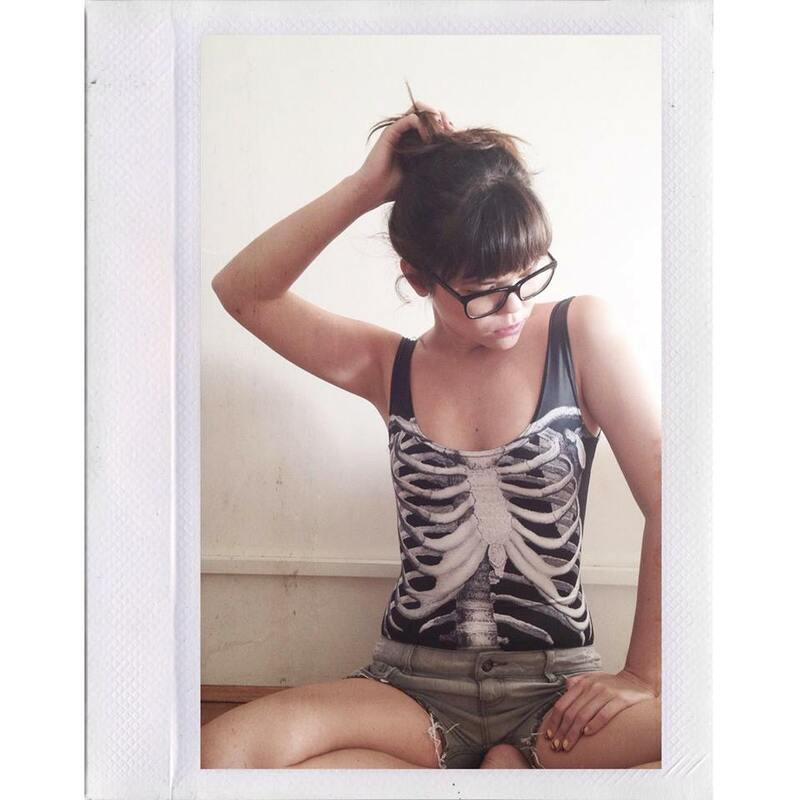 Read more about Lestari in this blog post. The Dolphin is one of my faves in Sydney at the moment. 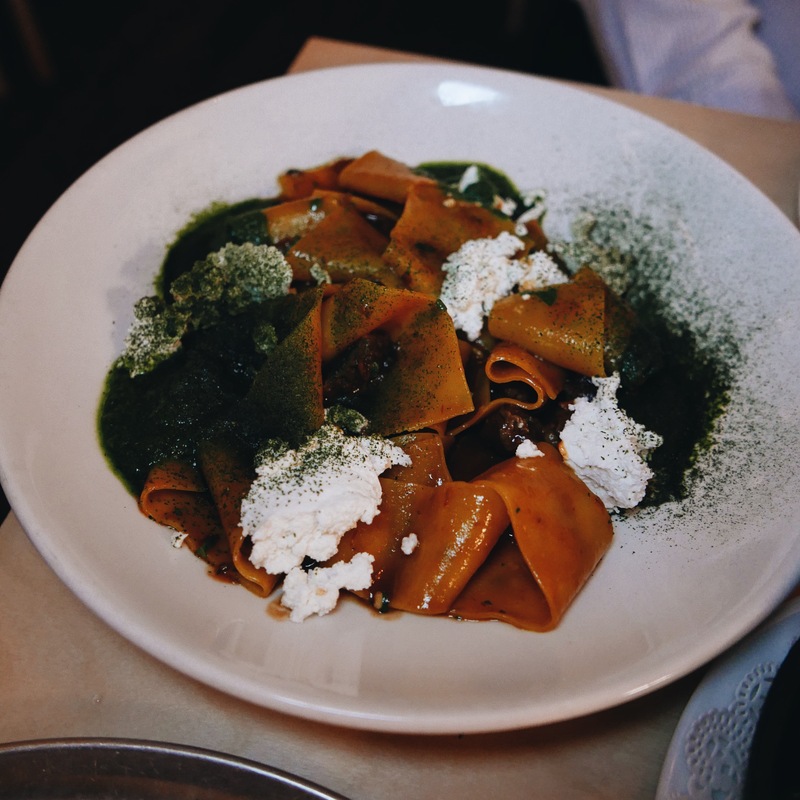 The refurbished Surry Hills pub serves the most perfect pappardelle with the most perfectly moreish bolognese, adorned with blobs of creamy ricotta. That’s all I have to say. Read more about The Dolphin here. When I see curry cheese fries with chopped onion on the new menu at Belly Bao, my eyes light up. These don’t disappoint, guys. 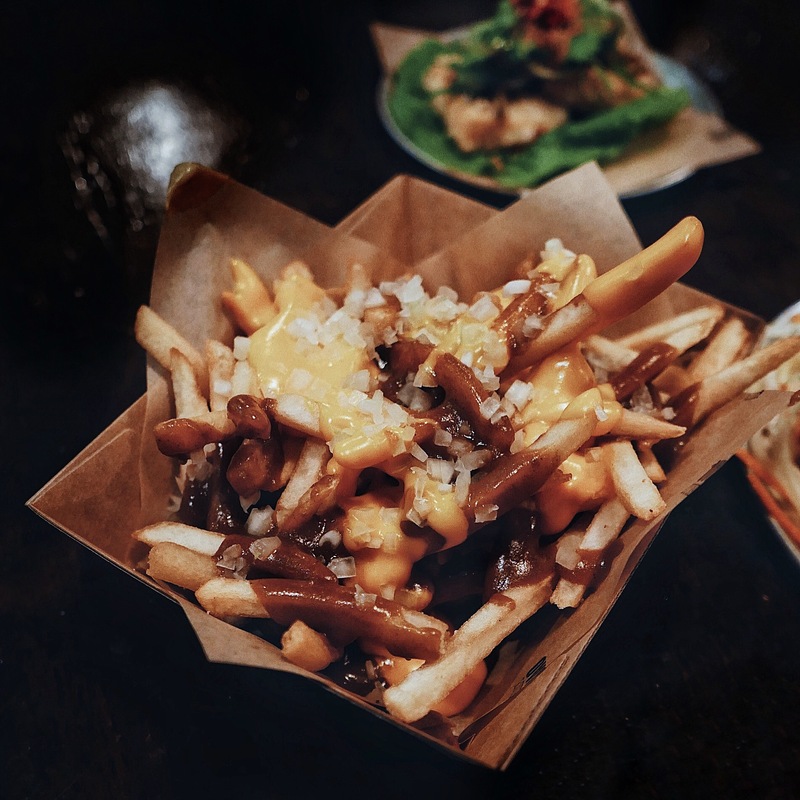 Curry, liquid cheese, onion – all things that belong on fries in my opinion. It gets pretty messy, so this is the one time I’d say using a fork for fries is permissible. Last year I went to New York for the first time and one of the highlights was those incredible New York pizza slices. While I’ll always prefer authentic Italian pizza over New York pizza, there’s something so satisfying about a NY slice – the way it’s a bit greasy and the way you can try so many different types by the slice. 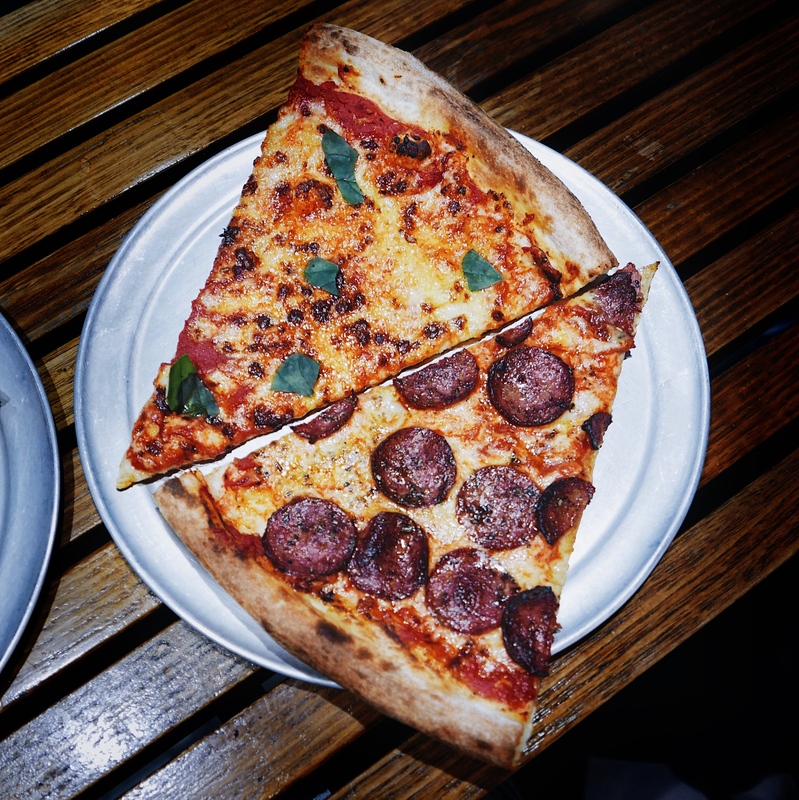 Epic Pizza has finally brought a slice of New York to Surry Hills. The OK USA slice is fantastic – even the pepperoni itself tastes American (read: a bit fake, which I kind of love). The best part? There’s chilli flakes, parmesan, and oregano to sprinkle on top to your heart’s content just like in New York. One of my friends adores chewy food. She always exclaims “so chewy!” when she’s happily eating something like rice cakes. I often prefer silky soft noodles over chewy rice cakes, but these New Shanghai rice cakes are ridiculously addictive. 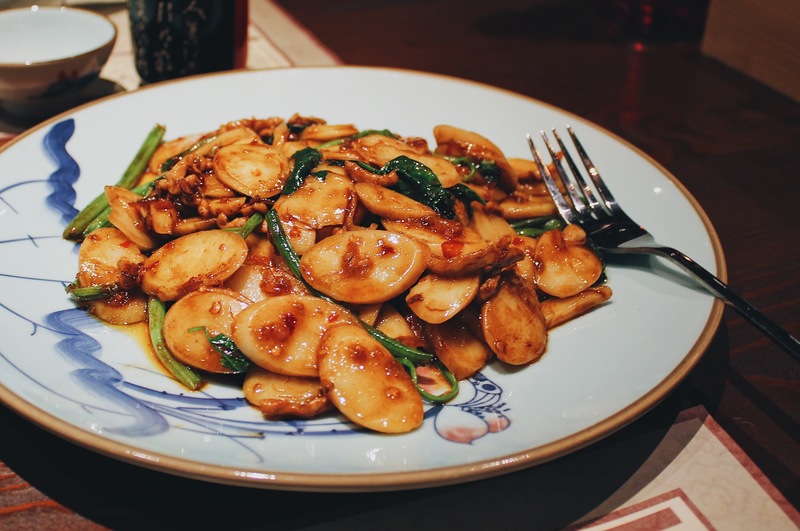 The oval slices of rice cakes are smothered in an umami XO sauce and bits of pork – you just can’t go wrong! Originally a Halloween special, Brooklyn Boy Bagels’ pumpkin bagel stuck around for good because it was so popular. And I’m so glad for it. Amongst two of my friends, we call the pumpkin bagel from Brooklyn Boy Bagels PIMPKIN bagel because a while ago we got too excited about using caps and typos. The name has stuck and in a strange way, it’s kind of fitting – like the pimp of all bagels. Armed with a chewier texture and slightly sweeter flavor than some of the other BBB bagels, the bagel has additional crunch from the pumpkin seeds on top. I’m not normally into congee all that much except bubur ayam (chicken congee) for breakfast in Jakarta with good hunks of cakwe (also known as youtiao or deep-fried bread), but the crab congee at Lucky Suzie has converted me. It’s bursting with flavor and has a touch of luxury with the addition of crab. 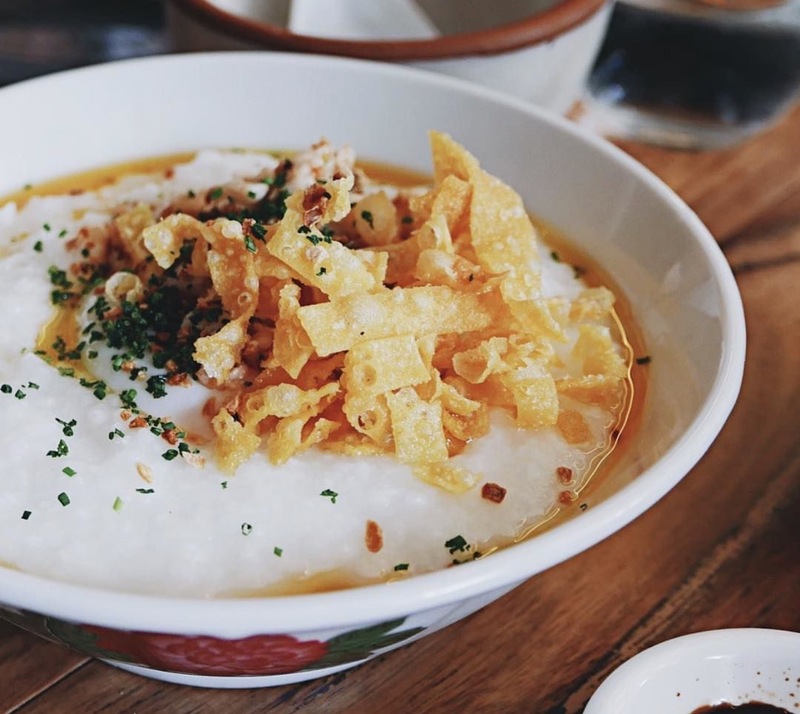 Plus you can’t go wrong with the lush textures of a smooth congee and a soft egg, countered with crunchy deep-fried wonton strips. While my favorite kind of bread is normally sourdough and rye, the wood oven fougasse at Fred’s is like a warm hug of love and adoration. The small loaf has a slightly chewy crumb and a thin golden crust. I’m also digging that both butter and olive oil are provided – (why not both?) – this should absolutely be a thing everywhere stat. A crunchy crepe filled with potatoes and spices? Yessss please. The holey, rough crepe is also served with a small bowl of curry for dipping and extra flavor. I’m a big fan of everything at Maya Vegetarian in Surry Hills, but the rawa masala has been my absolute fave so far. 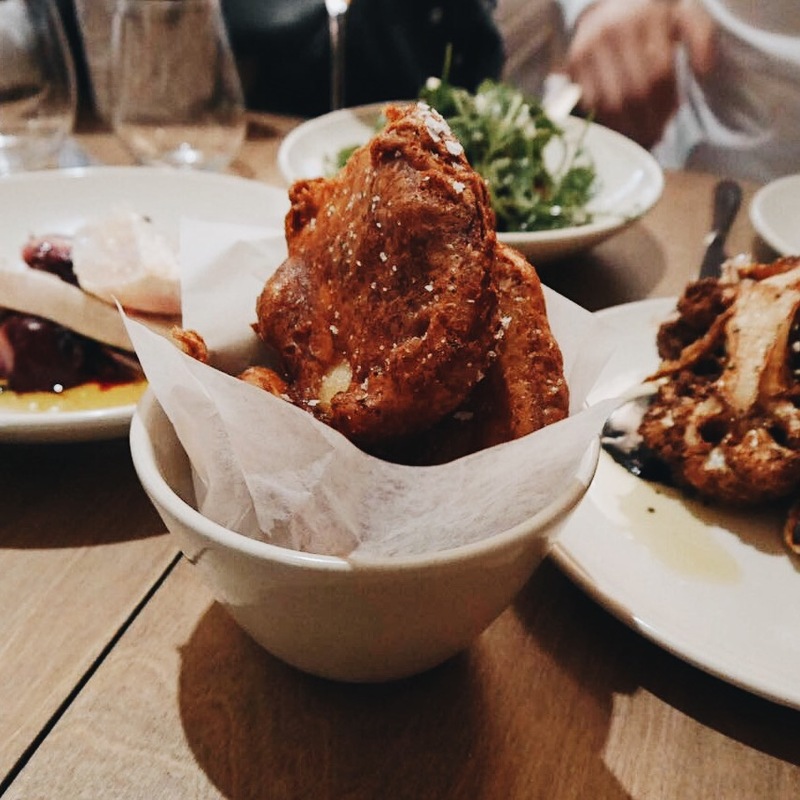 Chunky and thick, the potato scallops at Saint Peter in Paddington are coated with an impossibly crunchy batter, giving way to a creamy interior. We order one per person, but you could easily share one between two people. More about the menu at Saint Peter here (but not the potato scallops because they weren’t on the menu yet the first time I went). On a hot, sticky summer’s day, a bowl of naengmyeon (cold noodle soup) is a godsend. The long buckwheat noodles are served with scissors so you can snip them for easy eating. I recommend adding a bit of mustard for extra heat against the chilled broth. More on The Mandoo can be found here. I’m not normally into pastries, but when there’s cheese involved, it’s a different story. The Comté gougère at Bar Brose is a hot, hollow number with fantastic cheese flavors. Choux pastry like profiteroles are lost on me, but when it’s a savory choux pastry, I’m all ears. 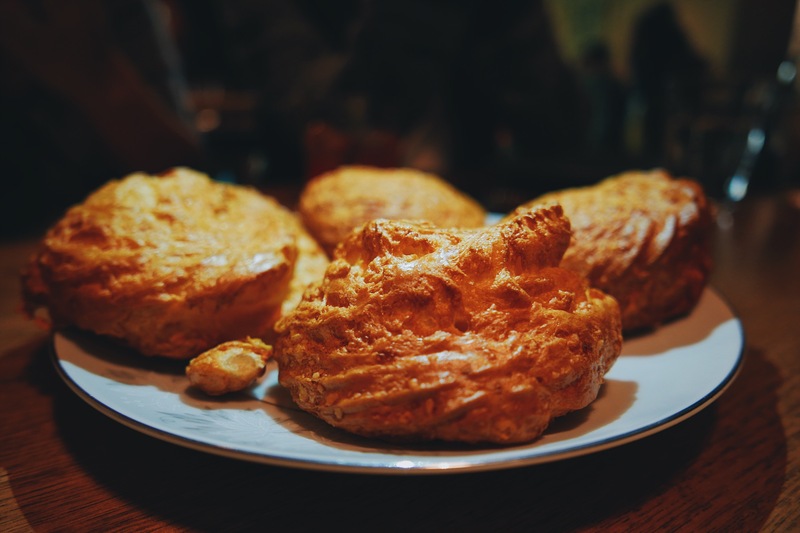 More on Bar Brose (but not the gougère) here. 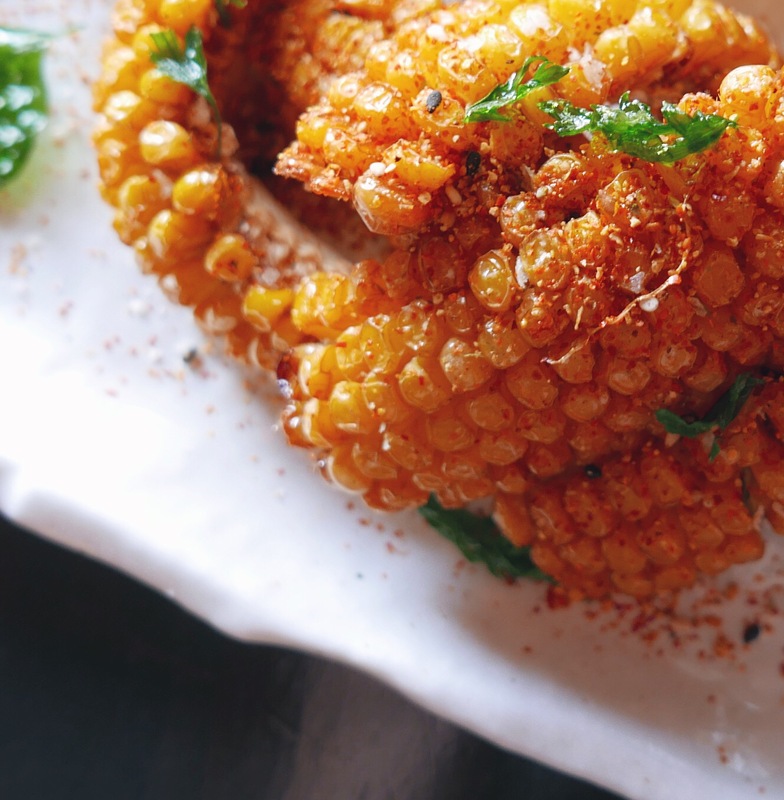 Coincidentally, the corn at Izakaya Fujiyama is also on my Best Veggies post (check that out here), but the curled morsels of fried corn sprinkled with shichimi pepper are such perfect snacks. Sometimes simple is best. So what do you think? What are your favorite carbs in Sydney? Disclosure: I worked at Brasserie Bread and Merivale previously. Yasss the Pommes Anna at Hubert and the Comté gougère at Bar Brose! A must order every time I go to both these places! Yaaaaas Pommes Anna at Hubert and mash and gravy at Mary’s are the best!!! Dude, this is a fantastic best carbs list! I really wanna try the zhajiangmian from Chinese Noodles and been eyeing Epic pizza! One of everything please! Argh so many faves here esp the pommes anna and Mary’s mash and…. Hehe so much carby goodness in Sydney! What an amazing list! Glad I found it. I’ll be sure to try at least a few of these.